Chinese human rights advocate Chen Guangcheng, who is blind, escaped house arrest in Shandong province last week – but his future remains uncertain. Chen, a self-taught lawyer who was imprisoned and then subjected to violence and house arrest for exposing forced abortions and sterilizations in China, made a daring, Houdini-like escape to the U.S. embassy. Following delicate negotiations with the United States, Chinese officials pledged to allow Chen to live a “normal life” with his family, and he initially agreed to return home. In recent hours, Chen has expressed a desire to leave China, fearing that he and his family can never enjoy freedom under the current system. The U.S.-China Strategic and Economic Dialogue is currently underway in Beijing. 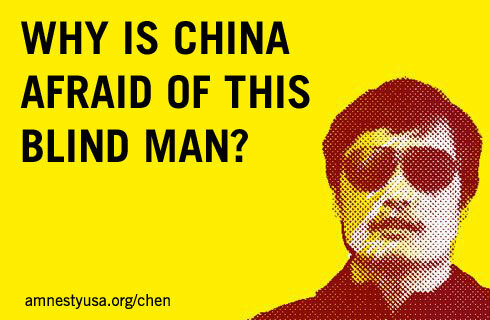 Now is the time to urge leaders to respect Chen’s human rights and allow him to choose his own future. Secretary of State Hillary Clinton is representing the United States in China today. Her presence can provide the pressure we need to ensure Chen’s safety. The world is watching. Let Chen choose his own future. This entry was posted in Asia and the Pacific, Censorship and Free Speech, Prisoners and People at Risk and tagged Chen Guangcheng, China, detention and imprisonment, human rights defenders, individuals at risk, prisoners of conscience by Frank Jannuzi. Bookmark the permalink. Frank Jannuzi is the Deputy Executive Director of Amnesty International USA and head of the Washington, D.C. office. I wanted to renowned you for this well-known expect!! I absolutely enjoying all diminutive speck of it I get you bookmarked to hinder away untried squeeze you tell. This is a good ennobling article.I'm just about glad in conjunction with your sensible work.You placed fantastically useful facts. Hold it up.